· The Machines are lightweight for easy portability and handling. · Body made of pressed steel with wrap/round handle and asbestos heat deflector. · It can use to straight cuts on any length, square or bevel edge. With the same precision these machines can cut circles and also shape with gradual curves with the use of circle cutting attachments, supplied as optional extra. 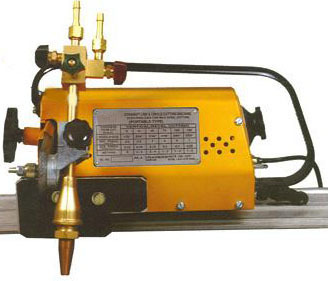 · Injector type Oxy-Acetylene/LPG gas Cutter, specially designed to prevent backfire. Nozzle Mixing type cutter also available, which is latest technology, much safer, absolutely backfire free. · Cutter can be Swiveled to cut levels up to 45° with Rack and Pinion. · Motor of Machines are fitted with 220 volts Fractional Horse Power. Geared reversible motors. Power is fed through a Forward-Reverse toggle Switch. · Aluminum Track 1.8 meter long can be supplied as optional extra. Bevel cut of 45° on either side of vertical on 75mm thick plate. 220 / 240 V, 50 Hz. 1 phase A. C. fractional H. P.